San Diegans came together on this Independence Day for a "Restore the Fourth" rally and march. 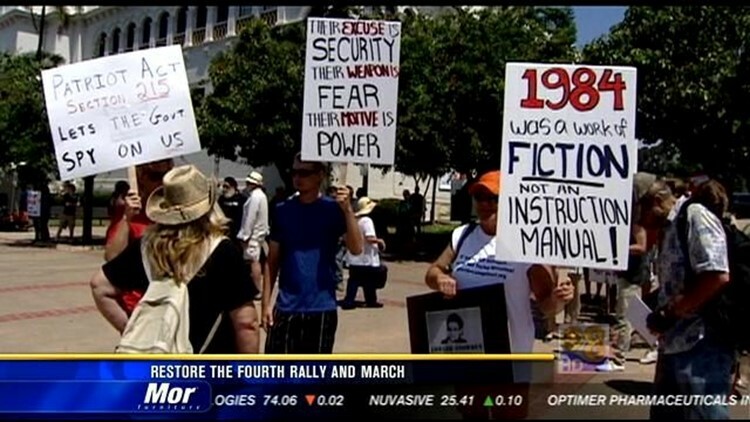 SAN DIEGO (CBS 8) - San Diegans came together on this Independence Day for a "Restore the Fourth" rally and march. The protest was part of a national movement against government monitoring and searches of Americans' electronic communications. Participants gathered at Balboa Park and marched to Senator Diane Feinstein's office. They are calling for better protection of the Fourth Amendment. "I think that all citizens should be innocent until proven guilty and I think that wholesale collecting data undermines that protection," protestor Steven said. Rallies were held in about 100 cities across the country Thursday. "Restore the Fourth" is a grassroots, non-partisan movement.